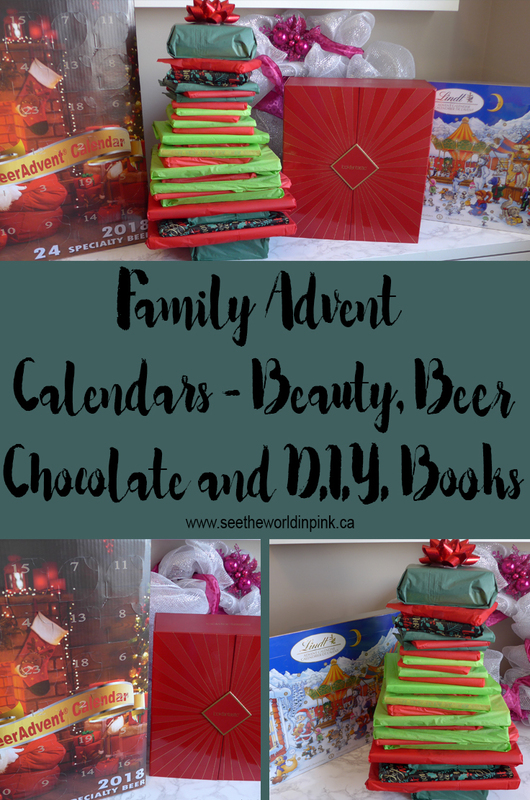 Family Advent Calendars ~ Beauty, Beer, Chocolate, and D.I.Y. Books! I absolutely love Christmas time, and what better way to count down to the jolliest day of the year than with a whole family variety of Advent Calendars?! We have been doing fun advent calendars in our house for years, and they keep getting better and better! It's always fun pick out a perfect advent calendar for everyone in our house, which includes me, my husband, our 13 year old and our 18 month old! For me, the mom and beauty lover of the house, I had to pick up a beauty advent calendar! I went with something different this year and went with the LookFantastic Advent Calendar because it's from the UK and am hoping that I will get different brands and products than what I currently have in my collection! It is $120 CAN; but, is supposed to have over £300 in value! I have actually managed not to see an spoilers for this Advent Calendar either, which is a little crazy! I have also tried the Ciate Mini Mani Advent Calendar and the Body Shop Advent Calendars in the past and really enjoyed them as well! So many beauty brands have advent calendars now and stretch a wide range of prices - anything from NYX to Lush to Charlotte Tilbury! You can find any beauty products you're looking for in an advent calendar. For me, I prefer something with 24 or 25 products, instead of just 12! My husband has gotten a Beer Advent Calendar for quite a few years and he really enjoys it! This particular one is from Costco and is $99.00 CAN - he has also tried ones that are all small breweries. I think Canada is a little behind in other booze calendars - I really want a mini wine bottle one and they are only available in the UK and US! But, I have also seen Gin and Tequila if beer doesn't tickle your fancy. Also, if booze isn't your thing, there is tons of tea advent calendars and I have gotten the David's Tea one for the past 2 years! But, I've seen a few other brands come out with tea and beverage calendars. Our house also has two kids to get advent calendars for as well - my older son is 13 and the younger one is a year and a half! This year we went with chocolate and books for the kids; but, there are so many kids advent calendars out there! So, it was surprisingly hard to find an ideal advent calendar for a 13 year old! Damian has gotten a lego advent calendar for years; but, he's just a touch too old for it now. Everything toyish is for a little younger and I wan't to make him a book advent calendar as well; but, teenage books are no where to be found on auctions and shops for a good price! Thus, he is getting a good quality Lindt Chocolate Advent Calendar; because, what teenage doesn't like chocolate?! And, it's not the cheap $2 grocery store ones! If you happen to have a good advent calendar suggestion for a teenage boy, I'd love to hear it because I will be in this same spot next year! And, for the little guy this year I went a little D.I.Y. (which doesn't happen often) and I made a book advent calendar! I found all my books used on facebook buy and sell/auction groups and spent under $30 total. I did have to get all board books because my kid is a bit of a tyrant with paper books; but, these look really cute with normal kids paper books! I just wrapped the books in a single or half sheet of tissue paper and stacked it up to semi-resemble a Christmas tree and stuck a bow on top! There are so many fun little kids advent calendars that I'm excited for when Elliott is a little older next year - Little People, Paw Patrol, and Disney Tsum Tsums! I'm so excited for December 1 for us all to start opening our family advent calendars together! I'm happy with all of our calendars this year and I don't think anyone will be disappointed! Are you in to the alternative advent calendars? What do you normally pick up?